A game not for the faint-of-heart. The Braves tied the Bulls in the 6th and then loaded the bases in the 8th, 9th, and 10th innings. But they did not score a run. In the top of the 11th they went ahead by a run. In the bottom of the 11th, however, Carlos Corporan got his first hit of the season and with the help of Nick Franklin, Kyle Roller, and Dayron Varona, the Bulls had a walk-off win. The Braves had twice as many hits as the Bulls, 16 to 8. Wilk has time in the Detroit, Pittsburgh, and LA Angels systems. Looks like one of those pitchers that the Rays seem to find each year that can help the Bulls (and maybe the Rays) before the end of the season. Plus he’s left-handed. Stats. Observations: Dayron Varona has one heck of an arm and he’s quick in the field. Playing right field last night he made a superb throw from the corner to 2B. Later a very powerful throw home was off-line, but still impressive. Jake Goebbert certainly has spent his time figuring out the Blue Monster in left. The Braves were tattooing the wall all night and he played each of them perfectly. Mikie Matook’s third triple in five games pushed his OPS up to .939. A very familiar face was playing second base for the Braves, Reid Brignac. Coming up through the Rays system he spent part or all of 2008, 2009, and 2012 with the Bulls. Beginning in 2013 he’s been with Colorado, the Yankees, Philadelphia, and Miami. He is not on the Braves 40-man this year. 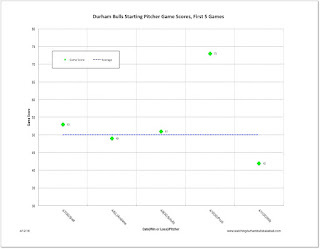 A left-handed batter, the Bulls had good luck with a shift last night. Richie Shaffer received some well-deserved recognition as the International League Hitter of the Week. Taylor Motter was profiled over at DRaysBay. 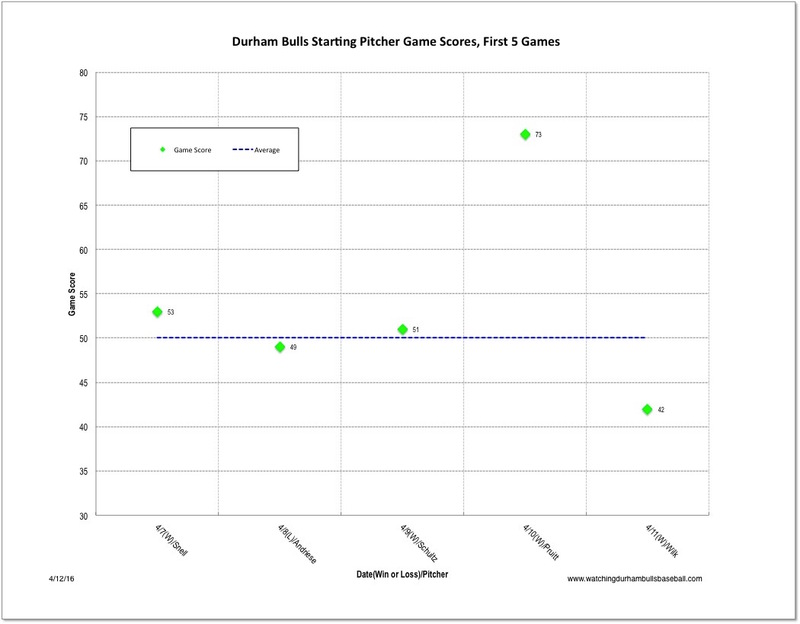 Chart: The Game Score stat of Durham Bulls pitchers. First time through the rotation. Yes, this has all the problems of small sample size, but, what the heck, this is a good time to just introduce this stat. Basically, Game Score is a measure of how a starting pitcher did in a game. See the formula at the link. If you agree that starting pitching is key to the game, then you want to see your starters keep their game scores above 50. However, starting pitching isn’t everything. We’ll get to that.